A few years ago, I taught a quilt class in my hometown of Earling, IA. There were some ladies from a neighboring town who wanted to take the class, but couldn't. So I scheduled a class for them in Dunlap. These ladies belong to a quilt guild that encompasses people within a 50 mile radius of Dunlap, so I met many nice quilters. I returned to do another class the next year. I do a trunk show while they are sewing, and they saw the Mexican Star Quilt. So they asked me to return and teach that class on Saturday. The class was being held in Denison, which is not far from Earling, so I went up Friday night to stay at my folk's house, then drove up in the morning. It gave me a chance to check up on how mom is doing after her surgery as well as visit with them! She is doing really well, though still tired and somewhat sore. As you can see, they were all on their way to some beautiful quilts! I love seeing the different fabrics that everyone uses and how they come together. That sashing is only 1" finished, so you get the idea of the size. It finishes at about 40" sq. with an added border. 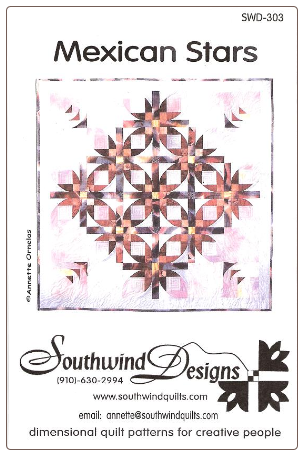 The pattern is from Southwind Designs. I ordered them from Quilting Horizons for this class....good prices, and service. They promised me that they would send me pix when they get them finished. The way these ladies were sewing, it won't be long! Looks like it was a gun class...great blocks! how beautiful. The blocks look so dimensional. I still remember when you first made the Mexican star. Off I went to buy the pattern and it is still unopened. Your students are doing great! All beautiful quilts started...how fun! I took the class a few years back at our LQS and it was great fun. I still display my purple/lavender quilt now and then. Your students chose lovely fabrics, bold and varied.